St John the Baptist, Inglesham. Box pews. Photo by Chris Gunns. Box pews provided privacy and allowed the family to sit together. In the 17th century they could include windows, curtains, tables and even fireplaces, and were treated as personal property that could be willed to legatees. Sometimes the paneling was so high it was difficult to see out, and the privacy was used as a cover for non-devotional activity….By the eighteenth century it became normal to install formal box pews instead of random personal constructions. This provided a more classic line to the church, although Sir Christopher Wren objected to pews in his churches. With the mid-19th century church reforms, box pews were generally swept away and replaced by bench pews. However a number of examples still remain in various churches throughout the United Kingdom. Part of the church reforms involved changing how clergymen were paid—fees from renting pews provided a good chunk of their salaries previously, so they resisted replacing them with more efficient seating. St. Mary, Stelling Minnis, Kent. Photo by John Salmon. Now, I assumed that these blocked your view of the rest of the congregation but that you could still see the pastor in his raised pulpit. But then I became very confused, because I discovered that the pulpits in Anglican churches of this period were usually not at the front of the church near the altar, but about half-way down the aisle! Did some box pews face backwards? Then how did people see when stuff happened at the altar…? Apparently this is because I’ve only been to synagogues and Catholic churches. Someone (Ros Clarke, was it you?) explained to me that Anglican church services of the 18th and early 19th century de-emphasized the altar to separate themselves from Catholics. Anglican ministers are not priests! They are just the first among equal congregants. And you’re not even supposed to look at the vicar! So yeah. Apparently part of the whole we’re-really-really-not-Catholic thing in Georgian Church of England services is that instead of having beautiful services full of pomp, you are supposed to stare at the wall so you don’t get distracted from pure spiritual thoughts. The box pew is actually designed to block your view. (As well as keep the heat in, obviously.) And indeed, they don’t all face the pulpit. 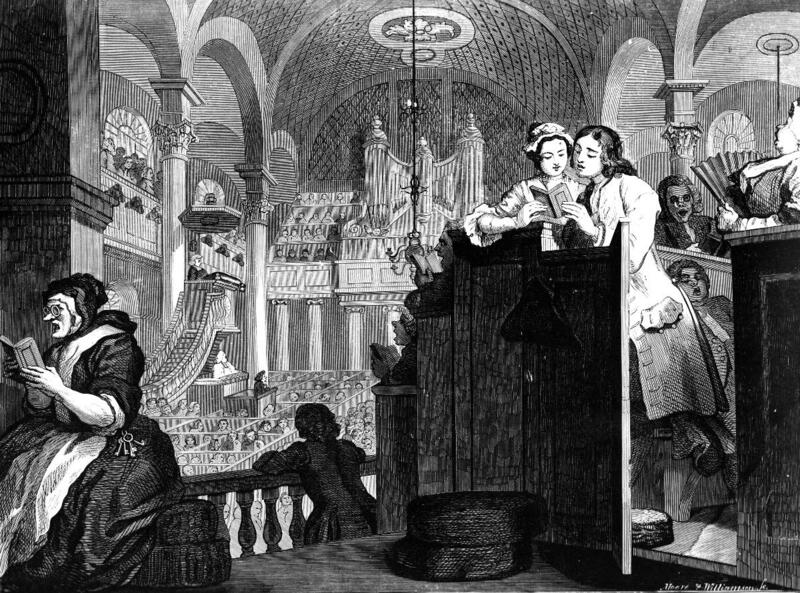 Look, in this Rowlandson drawing you can clearly see that the pews in this Church face both directions, some towards and some away from the pulpit, and few people are looking at the preacher. Of course, the pastor could still see you, which presumably motivated you to not goof off too obviously. For example, you can see the box pews and galleries in this early 19th century illustration of St. Mary’s in Horsham, then see the same church in this 1864 photograph, and then how it looks today after extensive renovations, with new pews and the galleries removed. “St. Martin in the Field,” Rowlandson. I also found this eighteenth century English evangelical church that was built backwards—the box pews for rich folk were on the second story and actually have their own separate entrances, while the poor people sat in benches on the ground floor. Do you attend religious services? What kind of seating do you prefer? I’m not religious so I have no idea, but sitting witht he family is fine with me, it’ll keep the youngsters from behaving badly. lol, actually Lydia in my book True Pretenses mentions that that’s a fantasy of hers too. 🙂 And you could totally fool around in them when the church wasn’t in use! The Anglican ministry has three orders – Bishop (who is also a priest), Priest (authorised to be solely responsible for the sacraments of communion and baptism) , and Deacon (can deliver a sermon, but cannot be solely responsible for the sacrament of communion etc). ‘Minister’ is a low-church (values of the reformation) catch-all way of saying ‘priest/deacon’ without actually saying ‘priest/deacon’… Vicar=parish priest. The way in which placement of furniture / type of furniture in the church reflects church politics is, I think, quite interesting! Other possible reasons for placement of the pulpit would be purely practical – there’s all this other furniture that needs to be in the church (lectern for reading bible passages, baptismal font, the actual altar, altar rail, choir stalls in some instances, maybe a pipe organ, seats for the clergy) The sensible place to put the pulpit is where the minister’s voice will best project without obstructing access to the altar rail (where the congregation go to take communion). Ooh, good point! I’m sure you’re right and acoustics were a part of the decision. But I’ve been in lots of old pre-microphone Catholic churches and most of them have the pulpit by the altar so I just assumed everyone did it that way! 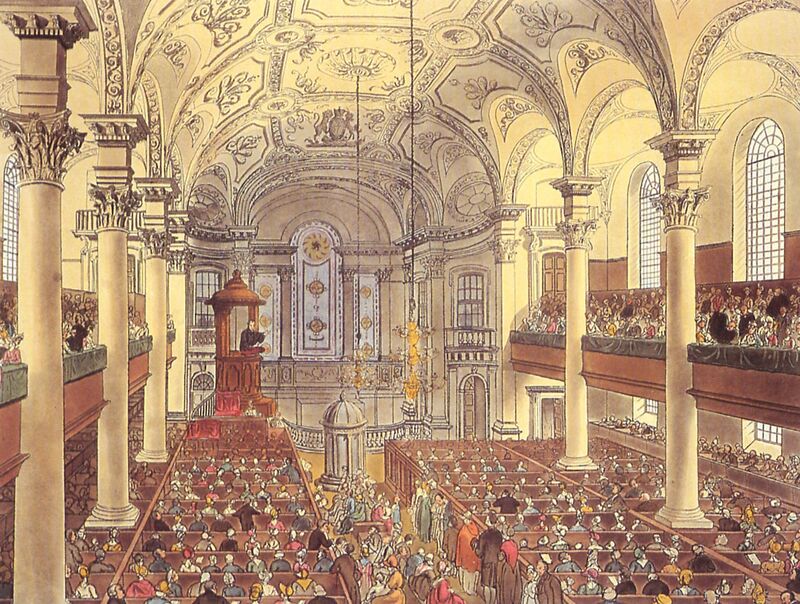 Plus, communion was a pretty rare event in Regency Anglican churches (not sure if this is still true), so I haven’t got a great answer for what exactly the altar was even used for at regular services, if anything…so much to learn! I agree, wooden pews are no fun to sit in. I’m glad synagogues mostly just have chairs. I prefer CUSHIONED seating. Great post! Me too! Luckily most synagogues I’ve been to just have chairs and in the one I go to, the chairs are pretty comfy. I had a vague idea of what pew boxes were. It is like going to a hockey game; those who fork over the most money get the best seats. Yep! These are like, the sky boxes of Regency church. Okay I looked it up, it was in the Queen’s Chapel in St. James [x], which sure enough almost certainly had box pews at the time! Mystery solved!! This is so very cool! I’ve never even heard of these (clearly I haven’t written any vicars, LOL!). Yes! As someone without much familiarity with Christian services anyway, I have had a lot of trouble really understanding how Regency churches and services functioned, especially because so much of it is so different from now! (I was so sad when I found out Regency Anglicans didn’t do midnight mass on Christmas…) But the research is fascinating. lol, yes, not a lot of lower back support in a box pew! Loved this article. Can see myself now sitting in a box pew and being all holy. LOL! I’m Catholic born and I raised my children to be the same until they could make up their own minds. I now have a non-practicing, an aetheist and a not sure about anything!! Thank you! And I think that’s great you let your kids make up their own minds. My parents did too…funnily enough I was not at ALL interested as a kid but got much more interested starting in college and now, although I’m still an agnostic, I enjoy going to synagogue a lot and would attend more often if I didn’t have to drive so far! Also worth seeing is St Mary the Virgin in Whitby which has box pews and a three tier pulpit. It’s at top of the steps near the Abbey.